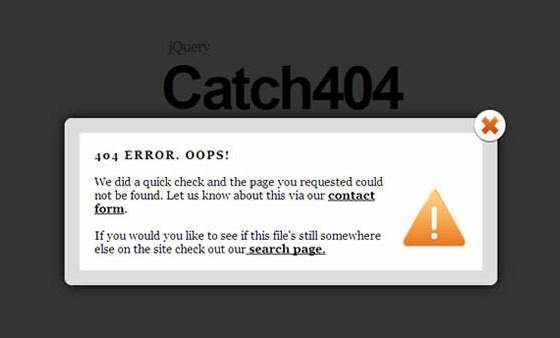 Today we are going to present a new jQuery Plugin is called Catch404. Through the magic of jQuery we’re going to catch 404 errors without your users even having to leave the page and then suggest some other options they’ve got using an inline jQuery Modal window. if a 404 message is returned, displays a modal box mentioning that the page does not exist. Else, redirects to the URL. The basic idea behind Catch404 is that you perform an Ajax query for a URL and handle the response provided accordingly, so if its a 404 error, we handle this error specifically. Now because cross-domain 404 handling with jQuery is something that has often been problematic to correctly implement, achieving this isn’t as straight-forward as it should be. Instead, the plugin uses a neat trick using the Yahoo YQL Engine to access the URL for us which returns a HTML string (local URLs don’t require this hack) – thanks to James Padolsey and Christian Heillman for their work in this area. Depending on the contents of this string response, we’re then able to handle the error from the same page the user tried clicking out from. In my plugin, a modal window is used to render the error message and it’s here that you’re able to define whatever message, links or tips that you would like to offer your users regarding the 404. This offers a much better user experience than traditional 404 handling because rather than taking them somewhere with no content, you’ve now got the option to either present them with an alternative mirror or advice through the modal window. Amazing plugin i m using in my blog..